First Baptist Church, located in Woodstock, Ga., is a busy faith community situated in suburban Atlanta. Located on a highly-traveled road, the church is a landmark with a large stone tower flanked by dual LED signs that can be seen by drivers approaching from either direction. When the original digital displays began to fail, the church turned to Southern Signs Systems of Marietta, Ga. for a new solution that would look great, be easy to program, and would pass the city’s new zoning ordinances. The company recommended two 16mm full color displays from Watchfire Signs. The original digital signs were 30mm red monochrome displays that the church’s graphics team found frustrating to work with. Not only did the signs limit the types of graphics that could be displayed, but they were updated using a slow dial up service. 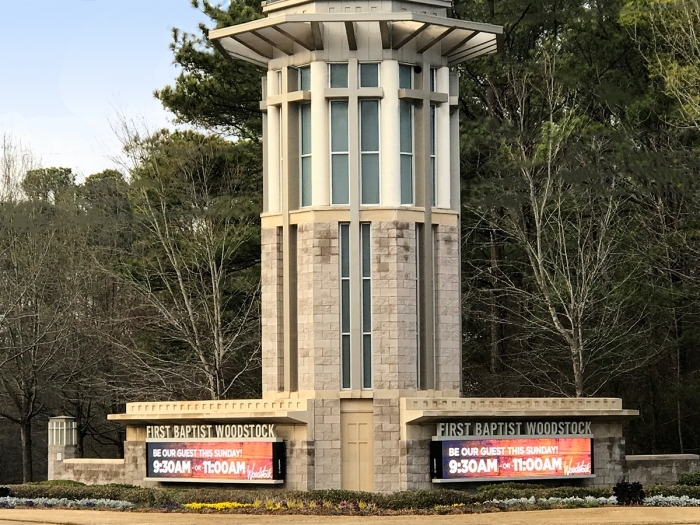 Now, First Baptist is able to post full-color, attention-grabbing graphics for its many ministries and events, and the results are impressive. The organization’s “Celebrate Recovery” group recently gained 10 new participants after promoting the ministry on the new signs. Doug Whitney, creative services director at First Baptist, was sold on Watchfire after visiting several boards in neighboring towns. “The Watchfire signs looked so good, and they are well constructed,” he said. Request our buyer's guide for a detailed look at what sets Watchfire apart from the competition. Learn the 10 key facts every LED sign buyer should know.